On April 1918 new fighters Fokker D.VII were delivered to the most known and experienced hunting units (Jastas). This plane is seriously differed among all others fighters of that time, especially for it's excellent flying performances, strong construction and highly live ness. British and French pilots, who's meet new fighter in the sky of Western Front, gave it nickname "square-nosed". Dogfighters with "square nosed" planes was fatal for allied planes in majority of cases. First barchs of Fokker D.VII were built directly on the Fokker plants in Schwerin. German Air Commanding need a more quantity of new fighters and soon Albatros Werke received order to produce D.VII under license. Apart head plants, located in Johannisthal, Albatros company had a branch plants in Schneidemuhl, named Ostdeutschen Albatros Werken. Possibilities of the OAW factory allowed building more aircrafts than Albatros and Fokker plants build together. Early OAW - built planes were similar to Fokker - built machines in almost details. Main difference was four-color lozenge fabric on all surfaces apart nose, where distinctive "giraffe" - like pattern is applied, - mauve stains on the green cowling. On May 1918 firsts shame news came from the Front: several D.VII crashed after in-flight fires; origin of these troubles was unknown until Lt.F. Friedrichs survived after same accident. He reported that ammunition in his aircraft caught fire and main fuel tank and fuels vapor around the engine flashed also. Ammunitions installation was improved. For best ventilation of engine many additional louvers on the lateral panels were added. Through all period when OAW build Fokker D.VII, different sub modification had non-similar external points of cooling system. 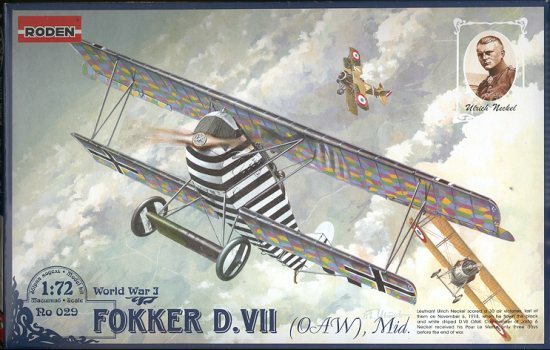 About 2000 Fokker D.VII were built by OAW in total, - larger than 50% from all built of this particular type. Allies captured big quantity of uncompleted OAW's D.VII after occupation of this Germany's region. Once again, I thank Roden for the historical background. Modern kits rely on the ability to get maximum use out of the molds as possible and still quench the modeler's thirst for accuracy in a kit. This has led to several trends. One is that unless multiple variants are possible from a type, it may not be molded. I think this accounts for not having such kits as the RA-5C and F3H in 1/48 scale. The other is that you will find 'specialty' sprues in a kit that allow the alteration of the basic kit into the variant or subtype that is being kitted. A look at Roden's catalogue shows that they are following this trend as are Hasegawa and others. Unlike Hasegawa, that often only allows a singe subtype to be built, Roden often offers a number of the other bits and pieces on the sprue and you just don't use the extra bits. 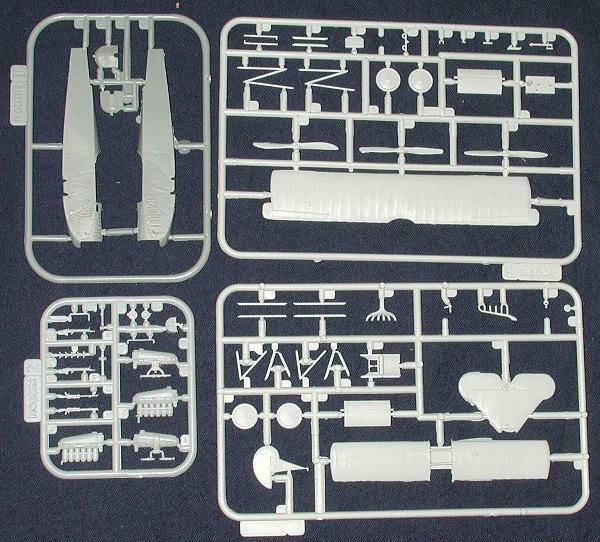 In the case of the D.VII kit, the different sprue is the fuselage as the forward section was often different depending on the subvariant or who built it. The sharp-eyed will also notice that the engine sprue is the same as what is offered in the Albatros kits! Anyway, you can see that there are other wheels and props as well which may or may not be used depending on how the instructions go. As for the parts themselves they are typical of Roden's kits as they are low pressure molded and so will show some flash and even a sink area or two, though I only found a couple of very shallow ones on the wing roots of the lower wing. One other thing that Roden has done is to provide a full lozenge decal sheet and a smaller one for rib tapes. These aircraft were often covered in lozenge fabric so it is most helpful to have this very large sheet added to the kit. The instructions are superbly done and expressly point out any modifications that may be needed as well as which parts go with which aircraft that you are modeling. In some cases you need to know the final markings scheme in order to determine if a modification needs to be done. There are five schemes for this kit from a variety of units. First is the box art aircraft of Ulrich Neckel of Jasta 6. This 30 victory ace had a black and white striped aircraft. The builder will have to do a lot of masking for this one! Next is Walter Blume's Jasta 9 aircraft. It is a black fuselage with white tail, nose and a large white stripe on the upper and lower wing. Eduard von Schleich's Jasta 32b plane has a full black fuselage and upper wing. Though most D.VIIs had lozenge on the upper and lower wings regardless of other markings, von Schleich's was a bit different in this regard. Rudolf Stark's Jasta 35b plane is mostly covered with lozenge except for the nose, a fuselage band and the tailplanes. The fin is white. Finally Friedrich Stoer of Jasta 35 B has a full lozenge aircraft except for the fuselage band and the nose that are in green. It seems that a white fin and rudder were standard on all of these D.VIIs. As you can see, all will require some painting and masking. The decal application will not be a short stint as it often is with some models as the lozenge will require quite a bit of time to apply properly. I can't think of too many people who are into WWI aviation that won't like this kit. It has a lot more detail than earlier kits by Revell and ESCI and offers a wide variety of options. Thanks to the fine folks at for the review kit. Visit them by clicking on the logo.